For larger pictures, click on the thumbnails below. Here is the backfilling of the crawlspace and over the French drain. 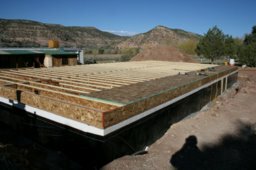 The footer down the middle will have a mid-wall on it to reduce the clear span of the joists and allow us to use smaller and less expensive joists. You can see the interior foam on the stemwall, but the black on the outside of the stemwall is a waterproof membrane covering the ICFs. The floor is OSB over I-Joists. All of these products are made from sustainable growth "plantation" trees and basically use waste wood that is not suitable for use in dimensional lumber. 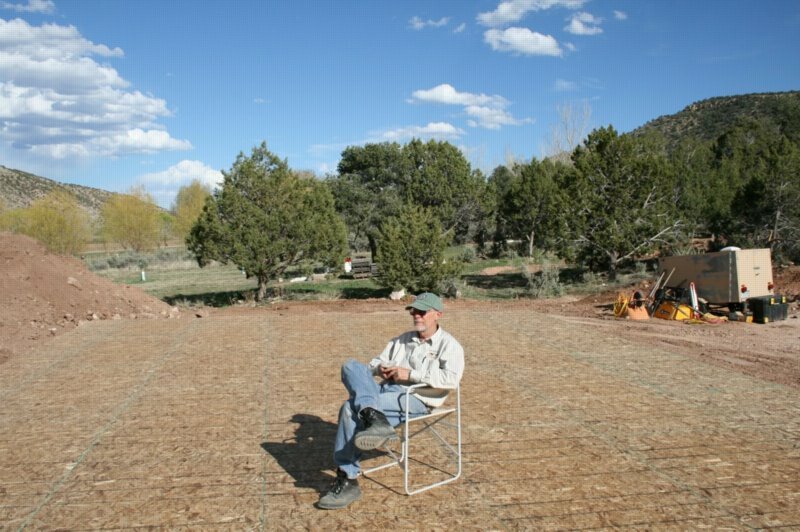 Dion enjoying a beer and the view which will only be available in a 360 degree fashion for a few more days when the walls go up. 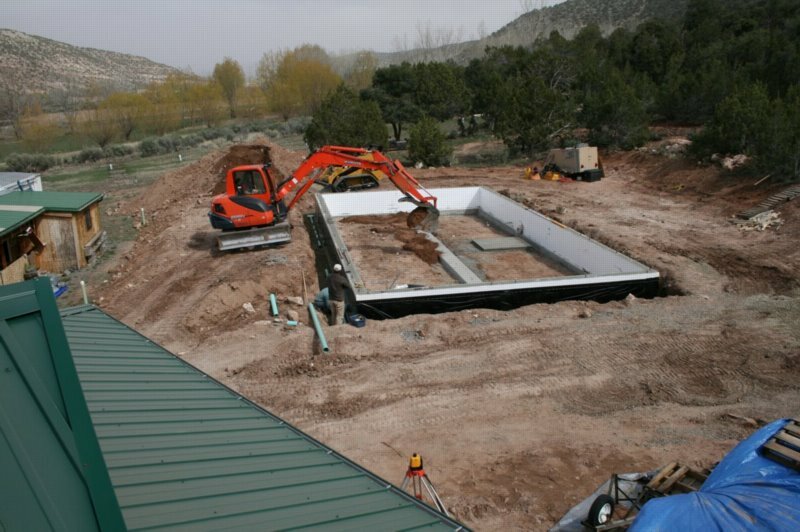 The first wall of SIPs installed. We chose Enercept for our vendor of the SIPS because of their excellent reputation, and the fact that two of our neighbors built houses with Enercept SIPs and were very happy with them. 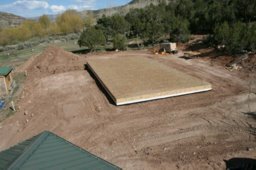 Our construction crew built both of those houses and they became very familiar with the technique. Two walls are now erected. All four walls are now erected. 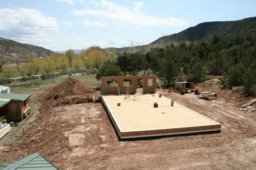 All walls are braced until the trusses are installed. Installing the trusses. This is the one part of the house which uses a substantial amount of dimensional lumber. However, the trusses are made locally. 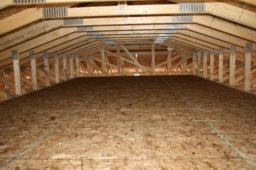 We had the trusses designed so that we have an attic storage space 12 feet by 24 feet and about 4 feet high in the center. 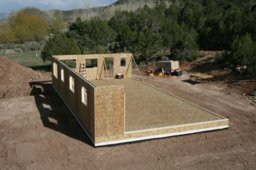 All trusses are installed and the roof sheathing with OSB has begun. More sheathing is on and the roof is nearing completion. 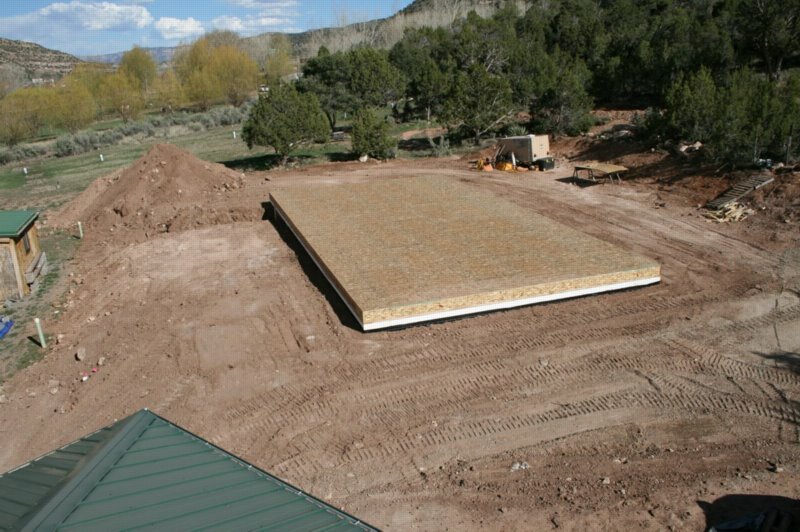 Roof sheathing has been completed, and the whole roof protected with Ice and Water Shield. This allows us to measure the exact dimensions before ordering the roof metal. The entire house is wrapped in house wrap to prevent water intrusion from outside. The windows have been installed, the sub-fascia installed and the crew has moved on to install the soffets. The soffets are a locally milled 6" aspen tongue and groove product, grown within 50 miles of us, and manufactured within 20 miles of us.